Renewable generation provided a new record of 742 million MWh of electricity in 2018, nearly double that of 382 million MWh produced in 2008, according to a new report from the EIA. Also, renewable energy accounted for nearly 18% of all energy generation in the United States in 2018. 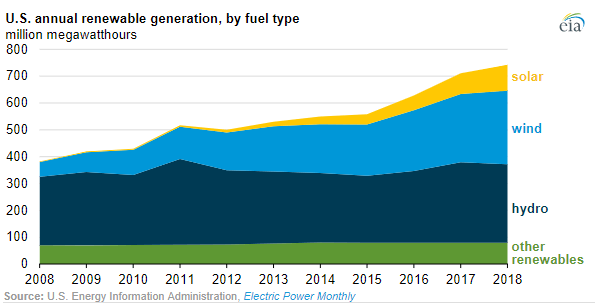 Nearly 90% of the increase in U.S. renewable electricity between 2008 and 2018 came from wind and solar generation. Wind generation rose from 55 million MWh in 2008 to 275 million MWh in 2018 (6.5% of total electricity generation), exceeded only by conventional hydroelectric at 292 million MWh (6.9% of total generation). U.S. solar generation has increased from 2 million MWh in 2008 to 96 million MWh in 2018. Solar generation accounted for 2.3% of electricity generation in 2018. Solar generation is generally categorized as small-scale (customer-sited or rooftop) solar installations or utility-scale installations. In 2018, 69% of solar generation, or 67 million MWh, was utility-scale solar.